Oslo – Today, Opera announced that the first Web 3-ready browser, Opera for Android, will now let people easily buy cryptocurrencies on their mobile phones. 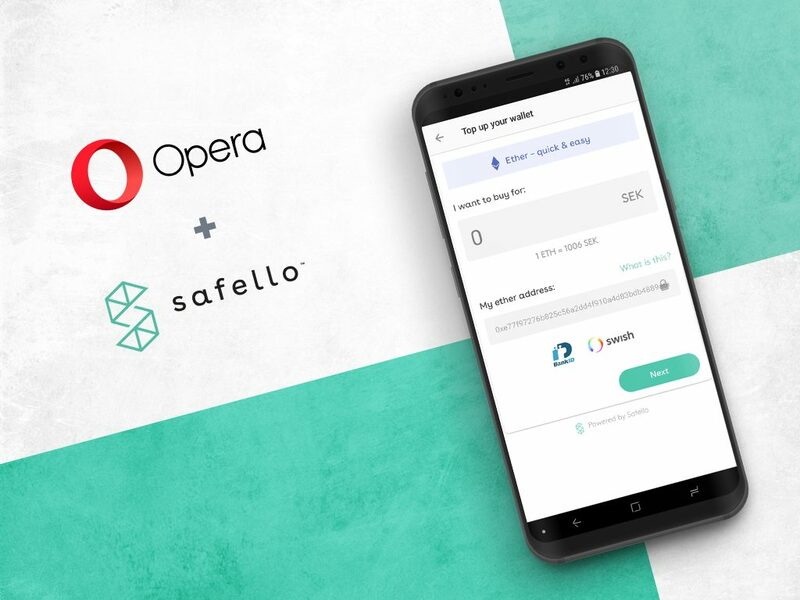 The Opera browser for Android now features an integration with Safello’s brokerage for a safe and easy crypto wallet top up. The integrated solution is available in Sweden, Norway and Denmark. This announcement is a further step in Opera’s strategy to eliminate hurdles associated with the use of crypto. In December of 2018, the Norwegian company introduced the first blockchain-enabled browser, Opera for Android, with a built-in crypto wallet and Dapp explorer. As an extension of this strategy Opera has partnered with Safello to facilitate crypto wallet top-ups with the ability to purchase Ethereum from within the browser. Safello’s solution verifies users’ identities securely and seamlessly with BankID and NemID. Users also enjoy the convenience of payments with credit and debit cards and transfers over trusted payment networks, such as Swish in Sweden. For a limited time, users in Sweden will receive a discounted fee of 2.5% from Safello. Users in Norway and Denmark will receive a fee of 5%. Safello reduces the process of buying cryptocurrency from hours, or even days, to less than a minute. To test the new, easy crypto wallet top up in Opera for Android available in Sweden, Norway and Denmark, download the “Opera browser beta” from Google Play store. View video to learn more. Visit www.opera.com/crypto for even more information. Founded in 1995 in Norway, Opera delivers browsers and AI-driven content delivery solutions to 320 million people worldwide. On December 13, it introduced the first blockchain-ready browser. Opera is listed on Nasdaq under the OPRA ticker symbol. Safello is an online cryptocurrency brokerage. Regulated as a financial institution, Safello offers a secure way to buy and sell crypto, in seamless transactions at industry-leading speeds. Partners integrate Safello’s brokerage solution to their web and mobile applications. Founded in 2013 in Sweden, Safello is driving crypto adoption for users in Europe and beyond, with a safe, efficient and user-friendly platform.